Each year we like to make a textured Easter egg sticky wall! Each year our eggs look a bit different. In this post I'm sharing my favorite version that we've been making over the past few years. All of my kids (ages 7, 4, 2) like to make these sticky eggs but the toddlers are usually the ones that have the most fun with this activity! I love introducing this activity again and again as my kids grow because it is such a neat sensory activity. To create the egg sticky wall we use a variety of materials to make the egg fun to the touch and see! There are so many different materials you can use for this craft so use your imagination! Start by cutting out a large oval from a large piece of construction paper. Next stick a piece of clear contact paper over one side of the construction paper. This will make it so that one side of your oval is sticky and one side is smooth. Stick the construction paper onto a flat surface (we like to use a window) using painter's tape. Make sure that you put the paper on the window sticky side out! 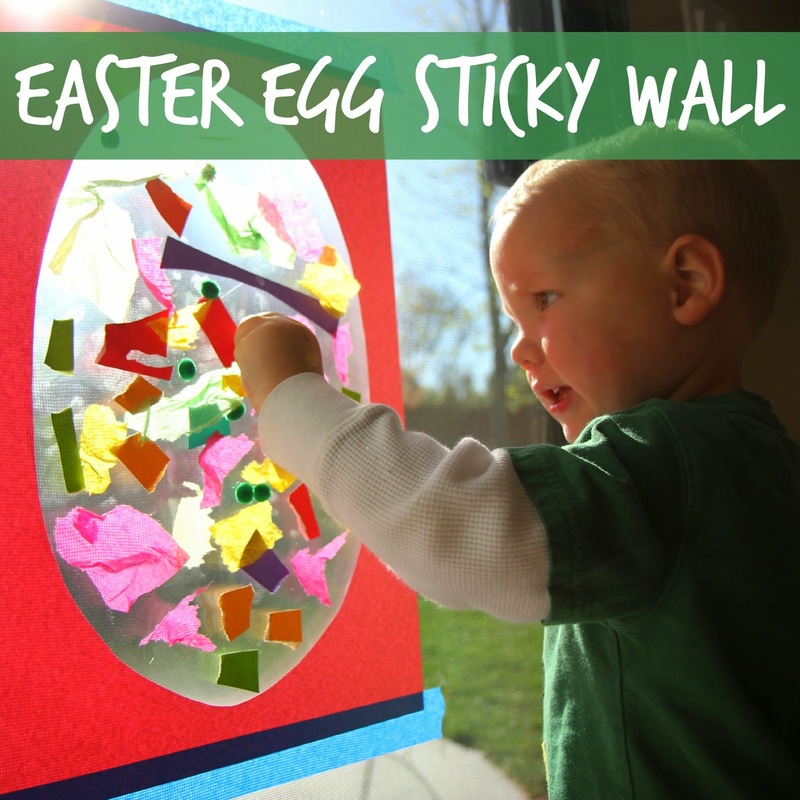 When you are ready to stick things on the sticky wall just set them up next the the sticky wall area and let your child explore the fun materials and stick them onto the wall to create a decorated egg. This was such a simple and fun activity for my toddler to enjoy! Have you ever tried making a sticky wall before? We've done a few and they are so much fun to touch and look at. My kids love that they can take things off and then put them back on again and again. Some of our other favorite sticky walls have included our alphabet sticky wall, our sticky wall matching game, and our sticky wall seashore. Do you have any other favorite Easter activities or crafts? We are sharing some of our favorites as part of our A Very Toddler Easter Instagram series right now.